Who should not take Nardil? Phenelzine is an antidepressant (monoamine oxidase inhibitor). This medication treats depression by restoring the balance of certain natural substances (neurotransmitters) in the brain. Phenelzine can improve your mood and feelings of well-being. Usually, this medication is used in persons who have not responded to treatment with other drugs. Read the Medication Guide available from your pharmacist before you start using phenelzine and each time you get a refill. If you have any questions, consult your doctor or pharmacist. What conditions does Nardil treat? List Nardil side effects by likelihood and severity. Before taking phenelzine, tell your doctor or pharmacist if you are allergic to it; or if you have any other allergies. This product may contain inactive ingredients, which can cause allergic reactions or other problems. Talk to your pharmacist for more details. If you have diabetes, phenelzine may lower your blood sugar. Check your blood sugar regularly as directed and share the results with your doctor. Tell your doctor right away if you have symptoms of low blood sugar such as sudden sweating, shaking, fast heartbeat, hunger, blurred vision, dizziness, or tingling hands/feet. Your doctor may need to adjust your diabetes medication, exercise program, or diet. What should I know regarding pregnancy, nursing and administering Nardil to children or the elderly? Some products that may interact with this drug include: other antidepressants (including maprotiline, mirtazapine, nefazodone, TCAs such as amitriptyline/nortriptyline), appetite suppressants (such as diethylpropion), drugs for attention deficit disorder (such as atomoxetine, methylphenidate), apraclonidine, bupropion, buspirone, carbamazepine, cyclobenzaprine, deutetrabenazine, dextromethorphan, certain drugs for high blood pressure (such as guanethidine, methyldopa, beta blockers such as atenolol, clonidine, rauwolfia alkaloids such as reserpine), other MAO inhibitors (isocarboxazid, linezolid, methylene blue, moclobemide, procarbazine, rasagiline, safinamide, selegiline, tranylcypromine), certain narcotic medications (such as fentanyl, meperidine, methadone, tapentadol), certain drugs for Parkinson's (such as entacapone, levodopa, tolcapone), street drugs (such as LSD, mescaline), stimulants (such as amphetamines, cocaine, dopamine, epinephrine, phenylalanine), tetrabenazine, "triptan" migraine drugs (such as sumatriptan, rizatriptan), tramadol, tyrosine, tryptophan, valbenazine. Does Nardil interact with other medications? Should I avoid certain foods while taking Nardil? If you miss a dose, take as soon as you remember unless the next scheduled dose is within 2 hours. In that case, skip the missed dose and resume your usual dosing schedule. Do not double the dose to catch up. 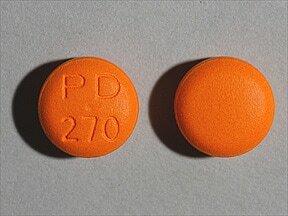 This medicine is a orange, round, film-coated, tablet imprinted with "PD 270". Are you considering switching to Nardil? How long have you been taking Nardil?